Have you thought the New Year strategies to boost up your eCommerce business? No matter whether your company is a startup or established, you need to implement some marketing strategies for eCommerce to obtain success in this competitive market. As eCommerce marketing has become a huge factor, you have to maintain some proven eCommerce marketing practices. 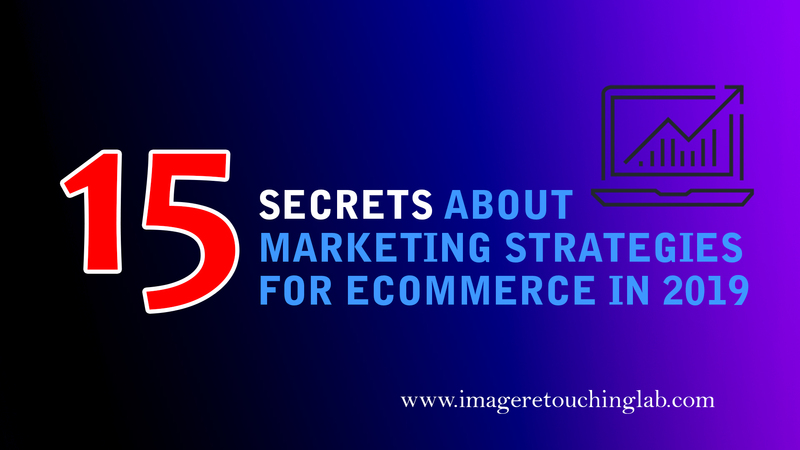 Luckily, we have found some of the trendy and important secrets of marketing strategies for eCommerce which will help you to boost up your digital business very fast. Are you ready to grab these? 1 OK! Keep Reading Our Best "Marketing Strategies for Ecommerce"
OK! Keep Reading Our Best "Marketing Strategies for Ecommerce"
Do you know the importance of proper planning or strategy? How does a proper strategy take you ahead from others? Many digital marketers haven’t discovered the importance of this topic. Actually, the whole process of increasing your sells depends on a proper marketing strategy. You have to know what marketing concept is. Then prepare your whole plan and start applying our eCommerce marketing ideas to achieve the expected output. Actually, the scope and scale of the eCommerce industry are so large that you can gain or lose just for implementing a proper or bad strategy. Put in your mind very carefully, 50% of companies fail just after a few years for not having a perfect marketing strategy. Focus on every small detail of the marketing strategies that are given one by one. Images are important to enrich your eCommerce website. It will create a value of your products to the customers. We look many marketers are uploading their product images only after shooting with DSLR or high-resolution camera. They are still not aware of photo editing or retouching before using on their web store. Does it make any sense? You have to keep it on your mind; visitors don’t love tasteless images. If you just upload a raw image to your store, it can remain poor in quality that can affect in sale deprivation. So, use photo editing service if you can’t do it by your own hand. Always remember, the best quality photo can increase your sales 100 times better than before. Your website must be optimized for both laptop and mobile devices. Don’t know why? It’s easy to browse the internet from mobile devices and also a popular way in modern time. According to Alexa ranking, more than 80% of websites are optimized for mobile users. If you want to reach your product to your customers, you must pay more attention to this fact. Well, most of the people have no time to sit on a chair all day long and browse the internet on a desktop or laptop. Just think of yourself! How much time do you get to spend on your laptop? You have to go for your job or class from the early morning to afternoon. After then maybe you go for a hangout or somewhere without your computer. Most of the time you spend the time is your Smartphone. So, make a user-friendly and responsive eCommerce website that can be easily accessed to users. Layout and checkout process should be attractive and untroubled which will make them stay more time to your website. Nothing is more important than unique and original content to reach your customers. People will know about products and yourself through your content strategy and quality. Guess how important it can be! Most of the successful marketers do care more efficiently on this term to engage their valuable customers with websites. Just think! If your customer doesn’t get any reliable and necessary information from your page, then why should they return to you again? Do keyword researches before you start writing content and ensure of using the key phrases to your key parts. Always remember, if your content quality is not good enough, nothing will change your ranking at all. Your content may be videos, blog posts, eBooks etc. This is just a straightforward fact. Google will rank through your quality content. Ultimately, content is the king, right? Choosing the best website for an eCommerce business is not always an easy term. It ensures your audiences to get most possible features that will help them to use your website in a more comfortable way. If your website doesn’t have enough features like Apple store or Amazon, then why should I go again? Firstly pay attention to the best design for your website. Think, it will create the first impression on our website. So be careful about this. If possible, hire a professional designer and let him/her know your expected design pattern for your store. Then it comes about the functionalities of the website. The more functionality you add for your website and store, the visitors will feel comfortable to visit it. Remember; don’t make it complex at the time of adding more features. Customers don’t like complexity on visiting any website. Also, work with page speed optimization for your website. A user has not enough time to see loading your page for seconds, right? Most of the marketers are investing their time and money for making their website and store mobile friendly. You can make your website to appear differently to your customers in different devices. It has to be 100% responsive for all devices. Another modern strategy is to make a mobile app for your store. Every well-known eCommerce stores have its mobile app as a part of their commercial business. Don’t you feel the necessity of this? It’s also an easy way to notify your customers through a mobile app and it will boost up the sales of your products. Ensure the features of your app are not less than the desktop version. It doesn’t fact whether your business is small or big. You always need a social media platform to represent your business to target audiences. Social media platforms will help you to connect your customers, and boost your sales. About three billion people around the world are using various social media every month. Aren’t you really aware of this important fact of your business? Actually, you are not getting engaged on social platforms not only to have more likes. You are building awareness of your brand, showing authenticity and providing the best possible support to your customers. Thus, your eCommerce business will be more reliable and will get brand loyalty through social media marketing strategy. Whatever you wish to deliver your customers, be very crystal. Doesn’t it make sense? Suppose you have some different products with different costs and shipping charges. Make it clear in add cart option or somewhere before the order is placed by the customers. The payment process should also be clarified before the order placement. These will increase a clear and faithful relationship among your brand and customers. One thing to remember you, make an easy checkout process for your valuable customers. No one expects a complex and lengthy way for completing the payment process. Customers want to know a clear and helpful description of your products so that they can make a decision through this. Just don’t try to hide anything about your product or service. Though it’s also a part of quality content, I prefer to put this on this section. Being updated on your industry news is a key term to be engaged more professionally with your business and customers. Audiences always expect updated information from Google on their preferred industry. When you are doing business in the eCommerce industry, let your customer know your knowledge about the updated terms and trends from your website. If some terms seems a little bit difficult to them, make clear and easy to them. It will obviously make bonding with your customers. Do you get any controversial topic from your industry or audiences? Try to turn the controversy into an informal discussion that will help your customers to be more engaged with your business. Sometimes you have to keep some controversial content into your blogs. Interesting, right? But it really works. When all are set up with design, functionalities, and contents, you are ready to plan for Search Engine Optimization. You have to keep a minimum knowledge about SEO to rank your eCommerce store on search engines. As this methodology is being updated after a few months, you have to be updated with the terms always. Try to reach your website and blogs on the first page of Google; otherwise, all the efforts of your digital marketing plan for eCommerce will not work. It’s no longer an optional strategy since ranking is the main factor in the web arena. In total, if you wish to increase your profitability, your website needs SEO. Referral marketing is a modern and trendy eCommerce marketing strategy to increase your sells. People will share your brand for their own benefits. All the giant eCommerce brands are using this method through a couple of years and they are on another level from you. Isn’t it? They are using this strategy as a secret weapon. Set up a referral program to your website with an attractive incentive for the affiliate marketer. Giving the right incentive, you are one step ahead to win the battle. Promote your referral program to let them know about your business and the incentives. You can invite your past customers to join your referral program. They are more trustworthy than the others. Many customers may have some confusion and queries before placing the order. Probably, we also face the situation before spending our valuable money to buy something online. So you have to be more creative and focused on making your FAQs (Frequently Asked Questions) page for your customers. What’s on your mind? How to create a Creative FAQs page? Then go through a popular eCommerce website and look forward to the questions placed by the customers. Guess if you buy the product, what type of queries can arise from your mind. That’s the tricky part of this fact. As a digital marketer, you have to read the customers mind. Still confusing? It’s all about reaching your customers and deal with. Think from the customer’s perspective, the answer is yours. Keep the answers short and simple and deliver them in a positive tone. That’s it! You can keep concluding this part with giving contact information. You have to give freedom to your audiences to reach you in the most possible ways. If I ask you how do you answer your audiences? It’s really an important term for your eCommerce business platform. Do you have a live chat option on your website? Then how can you convert your visitors to customers? Set up an automated chat greeting with any of multiple software tools or Plugins and answer your customers at your free time. It will increase the reliability between you and your customers. You can retarget the customer easily by answering some simple queries and information. Retargeting the customers can turn your profit double or more than before. You are expecting the customer who has already purchased from your store once. Do you apply to email marketing method to your audiences? It’s an early and beneficial strategy to boost your sale. Yes, it works. Make an interesting ad platform to reach your target audiences and send it each and everyone from your list. You don’t have to reach them from scratch as they have already purchased your products. You already know the customer’s choice, so you can show the ads according to your customer’s choice. How do you feel when you see a discount offer on your favorite product? Isn’t it amazing? Yes, everyone expects a discount offer on different occasions as well. Include various promotional offers on your eCommerce business. Just like buy one get one free, free delivery, gifts over a minimum purchase etc. At first, make a structure in its presentation according to your plan. When you decide to promote your products by showing these discount offers, you must target the audiences first. You can use the Media like Facebook, Twitter, Youtube or Google ads to reach your offer to your audiences on different occasions. Don’t decide to show the offers randomly. Make sure, you have a planned goal to reach your customers. Let’s hear from an ecommerce expert who has shared 12 strategies of his own. Share us if something seems different from our blog and interesting. Now time to finish it. We just provided the best possible marketing strategies for your digital marketing business. Most of the giant marketers are using these through years and we are presenting it for you. It will definitely convert your audiences to customers if you apply the procedures properly. Remember, a perfect eCommerce business plan is made with all these tactics together, not only with some of these parts. It’s not just magic that will generate millions in a few weeks. You have to be consistent with these tactics. The output will come out at the right moment. Do you have any secret outside these? Let us know the ideas by commenting below. It may help to improve the overall strategy to gain more success.